These ribbons are great new Christmas ribbons there are four rolls to choose from please choose the number of the roll you would like. Sold Each, all rolls are wired. This group has great plaid ribbons with a gold look to them sure to be a hit with your customer. Sold each, wired edge, please choose the roll you like. Blue and white ribbon with a snowflake pattern. Christmas ribbon with a fun chevron design. This group contains four different 2.5 inch wide rolls of bulk ribbon: red patterned ribbon, red and white dashed ribbon, plaid ribbon, and bright red green striped ribbon. 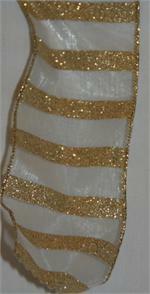 Decorative sheer ribbons with wired edges that are great for making bows. Mixed designs that are great for seasonal projects. 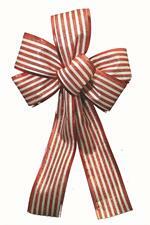 Assortment of red, gold and white striped ribbon. There are four rolls in this group of holiday ribbon. 1-3 are 2.5''x10 yard and ribbon roll 4 is 25 yards. 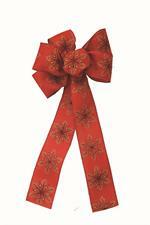 This group of decorative ribbon contains a wired edge and are sold individually. Ivory ribbons with a pinecone design. Ladderback plaid ribbon is bold and bright color for wreath decorating, crafts with ribbon, and making bows, comes in a 2.5 inch x50 yard bulk ribbon roll and has wired edges. There are 5 ribbon rolls to choose from, applicable to making wreaths, Christmas wreath decorating, bow making and evergreen boughs. The ribbon is sold individually. Melting moments red ribbon is a classic ribbon for crafts. Exceptionally durable for Christmas wreath decorating, handmade wreaths, evergreen boughs, bow making, and all sorts of ribbon crafts. Sold as bulk ribbon on a 50 yard roll.